What is it about gravy? Gravy is a sauce, but we don’t’ think of it as a sauce, it’s much more homely and down to earth than anything crafted in Escoffier’s kitchens. It’s a sauce for the people and family – not fine dining rooms. All home cooks know instinctively how to make gravy. It’s a timeless skill, learned while holding the apron strings of mother or grandmother as they cooked the family’s Sunday dinner. This familial association may explain our fondness for gravy. A traditional ‘roast dinner’ is an important family meal, a time to commune, catch-up and relax. The dinner itself is predictable. Pure comfort food, made all the more comforting by blankets of warm gravy. Here, at the family table, gravy becomes an elixir, not only melding flavours on the plate, but also imbuing its goodness to the people around the table, nourishing and binding relationships. We also associate gravy with prosperity. Real gravy cannot be made without meat. We therefore assume that if we are able to afford a joint of meat then times must be good. Gravy is seen as something special for which we should be deeply grateful, a bonus to the meat on our table – a luxury even (hence the saying ‘on the gravy train’). Of course, we’re also partial to gravy because it’s delicious. It’s a perfect sauce; meaty, smooth, stimulating to the palate – and it makes our food taste better. But perhaps there is more to gravy than emotional dependence, implied affluence, or even taste. Gravy induces highly satisfying habitual patterns of behaviour. We may have our meat served by others, but we will always serve ourselves gravy (judging a perfectly sustainable share of the gravy boat). We fastidiously daub each mouthful of food trough the gravy – then we might have ‘seconds’ and repeat the whole process again. Even when our plate is clean we cannot resist just one more drizzle on a select morsel, then a solitary leaked splodge on an empty plate so that we might wipe it clean again with the quick swipe of a finger (or in a more dignified, but less efficient manner, by attempting to capture the liquid on the tines of a fork). These little rituals may seem trite but they are powerful expressions of a roast dinner experience. Finally, gravy fulfils a physiological and culinary function. 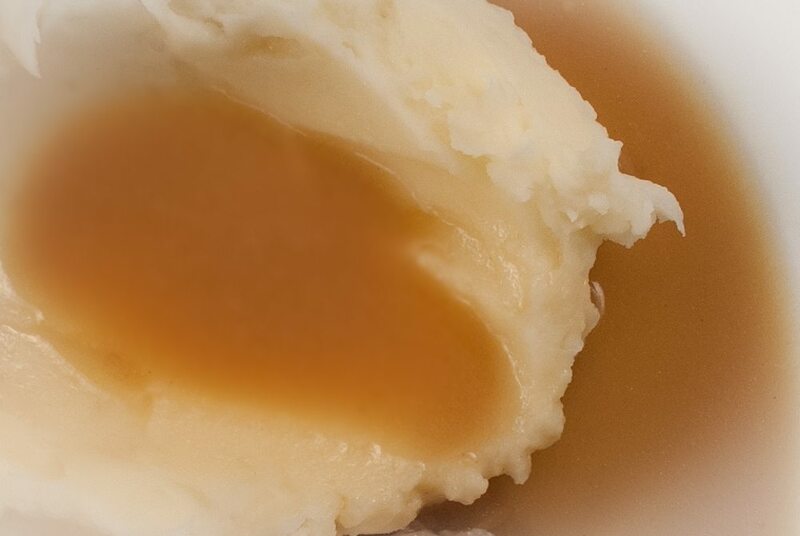 It acts as a hydrating lubricant; the gravy’s soothing, moisturising properties support our own saliva in aiding mastication, swallowing and digestion. And it cloaks less than perfectly cooked meat. Since roasting meat is a fairly hit-and-miss affair, making a good quantity of gravy is prudent insurance against our own human vulnerability in the kitchen. Natural roasting juices are known by the French as jus. The term causes consternation (and confusion) among the gravy cognoscenti – perhaps because au jus, (meaning ‘with juice’) is interpreted variously as meaning served with pure natural meat juices, a light gravy or a reduced sauce. For those seeking true gravy there is no ambiguity; gravy is bulked-out and thickened natural meat juices in various shades of golden to dark brown and served in generous portions. The time-honoured method for making gravy at home has always been to deglaze the roasting tray and its juices using vegetable cooking water and thickening with flour to a desired consistency. These days we might take a little more trouble, creating rich, aromatic and meaty emulsions into which we finally add the jus. The flavourful jus and sticky residues resulting from roasting a joint are the foundation of all meat gravies. But meaty flavours can also be extracted from other parts of the animal, including similar smaller joints and cheaper cuts, giblets (as in ‘giblet gravy’) and other types of offal. Bones too are a good source of flavour and these can be simmered for several hours to create a meaty stock. Certain foods, aromatics, herbs and spices and reductions will all add flavour to a gravy. Foods rich in umami such as mushrooms, seaweed, anchovies, soy, tomatoes can all provide a savoury punch. Aromatics such as garlic, celery and carrot will add sweetness and warmth. Onions – especially when burnt or slowly cooked to a soft brown heap can provide a deep and unctuous taste. Wine can be added for complexity and flavour, or even – in more classic circles – a dash of demi-glace (an extreme reduction of wine and stock). Other reductions such as balsamic vinegar or caramel can create flavour and colour. Herbs and spices enhance the character of a gravy; bay and thyme are common constituents and give the gravy an ‘English’ character; rosemary, may tilt the gravy toward the Mediterranean; whereas tarragon will shift it toward France. Finally, we must mention the vast range of scientific, but mysterious, commercial gravy products. These include the cubes, powders, tins and other formulae that make our instant bowls of gravy. We can only guess how the manufactures obtain their convenient meaty flavours, but these products make an acceptable and highly recognisable gravy. In America, it’s the custom to pair gravy with mashed potatoes. This is fine when it’s served with Thanksgiving turkey, but it’s more widely associated with Southern fried chicken. This might have the same counter-intuitive logic as serving crispy tempura in soup, but its popularity is indisputable; the amusement park, Knott’s Berry Farm in Buena Park, California, has served over 20 million fried chicken dinners with mash and gravy since it was first put on the menu in 1934. You can buy mashed potatoes and gravy by the tub at American fast-food joints. These pots of white fluffy potatoes smothered in shiny slicks of brown gravy might be so tempting because they resemble savoury versions of hot butterscotch sundaes. Another American favourite is ‘biscuits and gravy’. Here, good gravy is combined with tasty ham and toothsome scone-like muffins to create an anaemic gloopy mess of a dish. It’s hugely popular among die-hard gravy fans. Meanwhile, also in America, somebody came up with the idea of the ‘French dip’ – a roast beef sandwich dipped in gravy. The inventor must have realised that such a sandwich is nothing more than a deconstructed roast beef dinner – so it was logical to ask, ‘Where’s the gravy?’ And should we be surprised? We instinctively use bread to mop up gravy on our plate. Inspired by the French dip – we now have a chain of ‘Dip & Flip’ outlets across London. 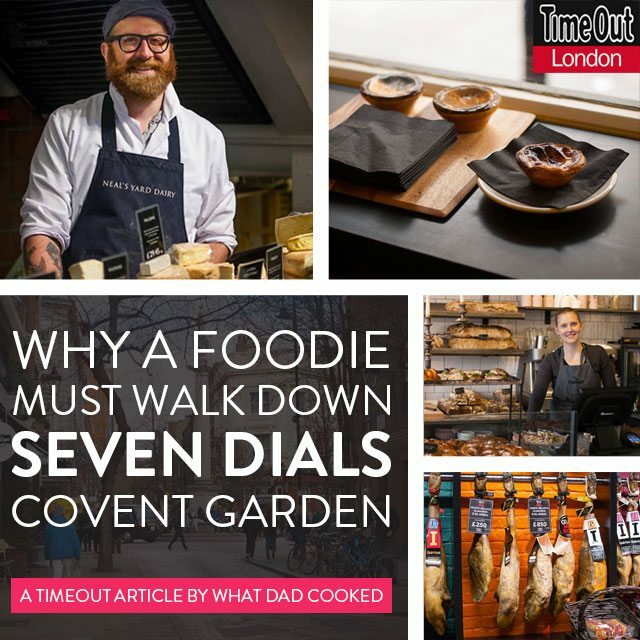 Their version is a burger with a side of gravy – though apparently customers are still going through the ‘inquisitive’ stage, not yet ready to dip and flip with gay abandon. Meat is excluded in the Northern English chippy specialty, ‘chips and gravy’. We may scoff, but it’s essentially the same outcome as pouring gravy over roast potatoes. Chips and gravy is beginning to appear down south and is becoming a popular choice for the young looking to satisfy the munchies after the pub on a Friday night. A variation on the theme is the Canadian 1950s creation ‘poutine’, which features chips and gravy but has added protein in the form of chewy cheese curds. The dish prides itself on its ambiguous etymological origins and its ramshackle appearance. Poutine’s popularity has spread across North America and is now making inroads into the UK. It’s clear that gravy has had a profound influence on our cuisine. It’s a symbol of our well-being, as well as a sumptuous conduit of flavour and pleasure. It’s become an essential component of our diet and is central to our most celebrated family meals. There’s no secret recipe; gravy is an open and shared affair with any number of interpretations using every imaginable method and ingredient. And gravy can be fun – it’s applied in all manner of novel and unique formats. Whether you like your gravy over chips in a plastic tray, or poured into tubs of mashed potatoes or licked off your plate, one thing is for sure – we can’t seem to get enough of the stuff.